I did it. I sent my query last week to two agents. Am I nervous? Oh yeah. I haven't heard back from either of them. I don't know if that means their busy and haven't got to it OR maybe, just maybe, I have a shot. So I feel a lot like the guy in the kayak. What's been your querying experience? How do you cope while waiting to hear from agents/publishers? Who's Buying Your Book and What Are You Going to Do About It? @ Dystel & Goderich Literary Management. Is There Gold in Your Backlist? Self-publish to Find Out @ Alan Rinzler. This is My Shocked Face @ Pimp My Novel. A Defense of Traditional Publishing: Part 5 @ The Steve Laube Agency. Asking a Published Author to Read Your Work @ Rachelle Gardner. Do You Really Need an Author Blog If You're on Facebook or Twitter? @ Writer Unboxed. 21 Quick Actions You Can Do Today to Set Your Blog Up for Massive Success @ ThinkTraffic. Difficult Conversations: Part 1, Part 2, Part 3 @ Rachelle Gardner. Getting Published Is All That Matters--Not Always...@ Babbles from Scott Eagan. Pitching Novels Face to Face, or Learning Literary Agents Don't Have Horns @ Stet! Getting Back to Speed (Query do's and don'ts) @ KT Literary. How to Format a Query Sent by Email @ Janet Reid. Multi-Book Contracts @ Rachelle Gardner. Online Presence and Editors and Agents @ Babbles from Scott Eagan. Interiority vs Telling @ Kidlit. Resist the Urge to Explain @ The Blood-Red Pencil. Introducing...the Character Traits Thesaurus @ The Bookshelf Muse. Building a World from the Ground Up @ Mystery Writing is Murder. The Scope of the Conflict @ TalkToYoUniverse. Straight Dope on Semicolons @ My Daytime Drama. The Case for Putting a Manuscript in the Drawer @ Nathan Bransford. The Beginning and the End @ The Blood-Red Pencil. Real Life Diagnostics: POV and Openings @ The Other Side of the Story. Re-envisioning a Scene Without Rewriting It @ TalkToYoUniverse. Advice for Writers Who Want to Be Published @ Adventures in Children's Publishing. New Agent Alert: Susan Finesman of Fine Literary @ Guide to Literary Agents. New Agent Alert: Jeff Ourvan of the Jennifer Lyons Literary Agency @ Guide to Literary Agents. The Hunger Games: Barbie Edition @ youtube. Brooke: Keeping fingers crossed and prayers said for a good result for you. What a great photo to accompany your post. 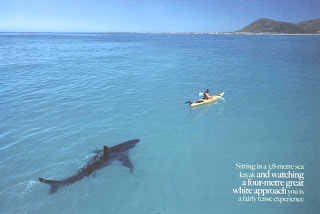 Too bad it's not the other way around...with you being the shark and the agents being in the kayak. So far my only coping skill has been avoidance. I'm looking forward to the moment ahead. It'll be a great excuse to do something different.